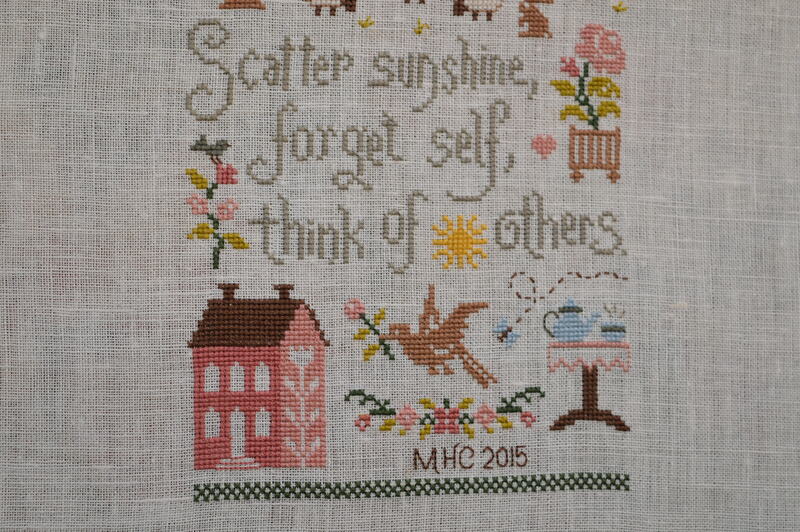 I started this Positive Thinking sampler at the end of July, I was going to Tea and Tents, the WI camping and crafting festival, I wanted something not too big that I could sit and stitch in the sunshine. It fitted the bill perfectly and in many ways reminds me of the wonderful week-end, it’s even got a teapot on it! This week I managed to complete the final section, I love the little tea pot and cup on a table with a pretty cloth! I was tempted to stitch the bird as a dove, but I decided against it as I would have the same issues with disappearing doves that I had with the sheep and the bird was a more complicated design, so it stayed as a brown bird. I had the choice of putting the name of the poet or my name, I decided to just stitch my initials and the date. I took it down to Artworks in Otley for framing on Wednesday and by Friday afternoon it was ready to collect, now that’s what you call service! I’ve really enjoyed stitching this sampler, it’s grown quickly and I’ve already got my next pattern from Nathalie organised, but this ones going to take a few months I think! 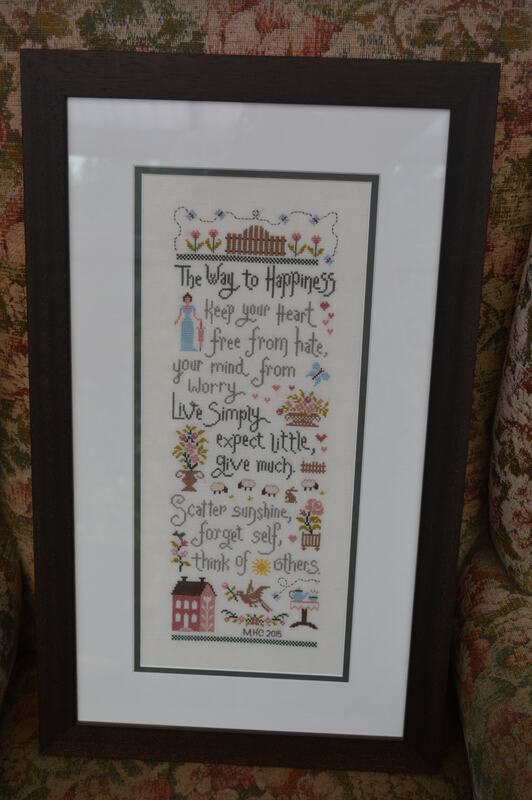 This entry was posted in Sewing and tagged Jardin Privee, Positive Thinking, Way to Happiness. Bookmark the permalink. Thanks Deb, I’m doing cross-stitch whilst my eyes can just about manage!! I find it quite addictive once I get going! Very pretty. I like the frame you chose also. I am looking forward to watching your next pattern emerge. Thanks Cathie, my next one will take a while, its called Sampler aux Bouquets, I’m doing three in a row so it will be about 18cm by 80cm!!! Very nice! CCS takes a while but the finished product is well worth the time and effort. Oh what a lovely poem and you did a great job on it! Absolutely gorgeous! Congrats on a finish… and it’s already framed too! Oh this is lovely! I’ve done a sampler by Jardin Prive and I love their style. Now to go check this out…you do beautiful work. Thanks for sharing! Congrats on that lovely finish. I just love samplers. When I used to see well enough to cross stitch that is mostly what I worked on. 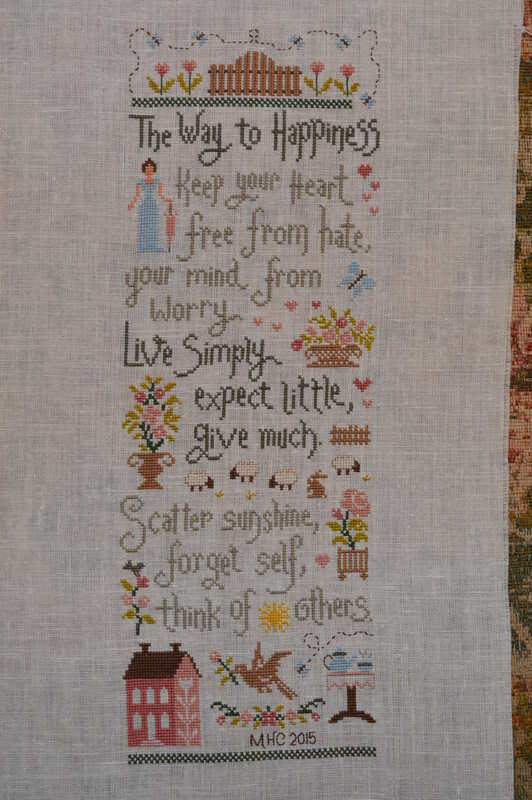 Such a gorgeous stitchery, congrats on your finish, words to live by.